Come to the Meet Your Mature Match adoption event hosted by OC Animal Care on Saturday, October 26 from 10:00 AM to 2:00 PM for FREE adoptions on pets ages 4 and older! 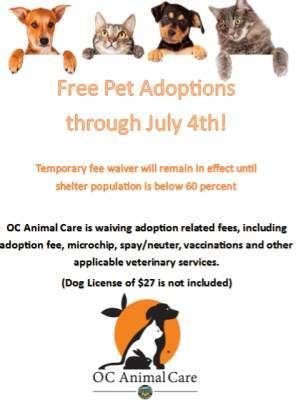 The free adoption does not include microchip and license. 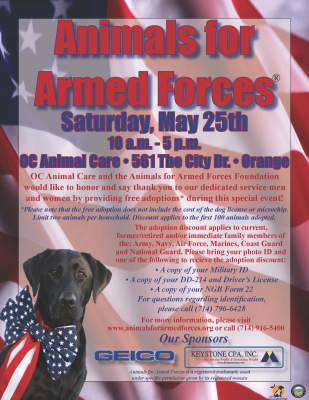 OC Animal Care and the Animals for Armed Forces Foundation would like to honor and say thank you to our dedicated service men and women by providing free pet adoptions* during a special free event set for Saturday May 25, 2013, from 10:00 am-5:00 pm, at OC Animal Care, 561 The City Dr. South, in Orange. Iams Home 4 The Holidays & Hilary Swank Aim To Place 1.5 Million Pets Into Homes This Holiday Season! Iams Home 4 the Holidays (IH4TH) needs your help to place 1.5 million pets into loving homes by January 4, 2010! With nearly 8 million homeless animals in the U.S. today, and almost half scheduled to be euthanized this year alone, our help is needed now more than ever. 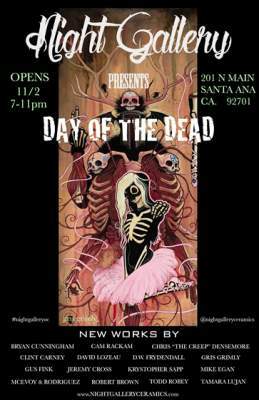 (Orange, CA) OC Animal Care, along with other local Orange County Shelters, non-profit animal rescue organizations, and animal advocacy groups including the Friends of Lake Forest Animals, are joining together to provide resources for Orange County residents considering a new forever friend this holiday season. The coalition will announce the effort during a press conference to be held at 10 a.m. Wednesday, December 2, 2009, at the OC Animal Care Center, 561 The City Drive South, in the City of Orange.